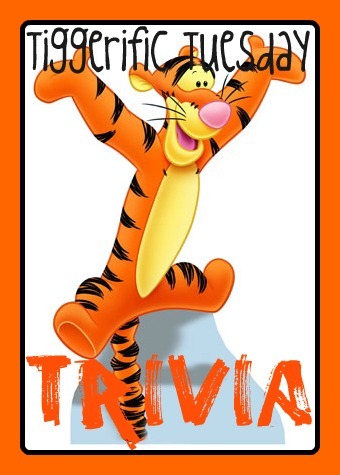 Hello, and welcome to this week’s Tiggerific Tuesday Trivia for this week! Today, Sophie is taking us over to Disneyland for a question from Mr. Dave Smith’s book Disney Trivia From the Vault, which you can pick up at Amazon.com. Just click on the link to go to the Amazon.com website! Is it true there is a hidden Mickey Mouse symbol located somewhere in every ride at Disneyland? This week Jenn from Disney Babies Blog is at Walt Disney World — where she was running in Disney’s Princess Half Marathon this weekend! Congratulations, Jenn! Of course, that means she isn’t participating this week, but don’t forget that Jodi from Magical Mouse Schoolhouse and Heidi from Heidi’s Head are participating! Just click on their links below to see what they are writing about today, and thanks for stopping by! Did you know that Pixie Vacations is having a contest to give away a trip to Walt Disney World? Each week they will select one lucky winner to win a special Magical Mickey plush doll, and this new friend contains some extra special magic — and for one lucky winner, one of them contains a 4 day, 3 night trip to Walt Disney World for up to four adults! If you win one of the weekly drawings, but don’t win the trip, there are still special goodies in the other dolls, so enter each week to see what you might win! To enter, you need to go to the Pixie Vacations website, and while you are there, take a look at all of the great specials that they are running throughout the year! Good luck everyone! Don’t forget that I’m a new Pixie Vacations travel agent, so if you would like for me to help you plan your next magical Disney vacation, I’m here to help! Our concierge level services are available free of charge, so why not see what we have to offer? You can reach me at 919-606-6725 or by email at Mike@PixieVacations.com, so reach out to me — I’m here to help! In our attraction series today, I’m taking an in depth look at the show and pavilion that is the American Adventure in Epcot’s World Showcase. In addition to what I’m writing today here, I’m also guest posting over at my friend Jodi’s site, Magical Mouse Schoolhouse, where I’m also writing about the pavilion. To link on over to the post there, you will find a link at the bottom of this post. My idea for this post was to focus more on the attraction, but in doing my research, I learned some incredibly cool things that I didn’t realized when I first wrote my post for MMS. As a result, I’m going to give a little bit of information about the structure that houses almost all of the elements to this great pavilion first. That the building is made up of 110,000 bricks made from Georgia red clay? Or that the pavilion itself comprises a stunning 108,555 square feet?! Lastly, did you know that the “war wagon” — as it is known — is a computer operated device that moves and loads the different scenes in the show automatically, and that there are ten different sets underneath the stage that the “war wagon” controls? The theater that is housed inside the American Adventure pavilion seats 1,024 people, and in the theater, the show We, The People tells more about the greatest resource that our great country has — it’s people. 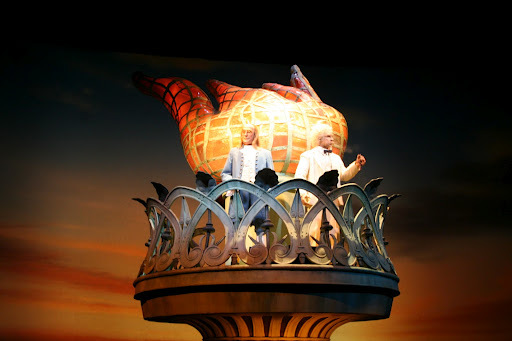 This show, which is one of the best at Epcot, in my opinion, doesn’t get the due credit it deserves. Too many people think that this show is boring, or that it is only good as a way to get out of the hot Florida sun, or as a place to take a nap. This is unfortunate, because the American history that this show looks at is a part of what made our country great. It is my belief that, if we were to look to our past, we could use the lessons that we learned there and restore our country to what it once was — the greatest country in the world. For a greater look at the entire American Adventure pavilion, stop on over and visit my friend Jodi’s site Magical Mouse Schoolhouse to learn more in a special guest post by yours truly!